Preheat the oven to 375. 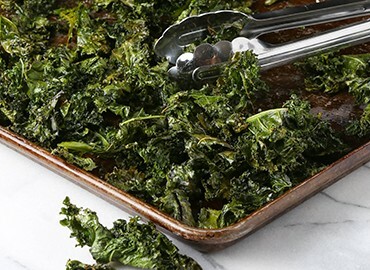 Place the kale on a sheet pan and drizzle with oil and salt. The pan will look overflowing but don’t worry as the kale shrinks down to at least ½ the size. Bake for 15 minutes moving the kale a few times to ensure even cooking. The kale will be crispy and is delicious hot or cold.